Taj Gibson knows all about game winning shots, certainly one. Though it’s Nazr Mohammed’s. Gibson’s space in the Bulls locker room is adjacent to Mohammed’s. And Gibson says just about every day Mohammed pulls out his cell phone and shows him an Instagram of a Mohammed game-winner from when Mohammed was at the University of Kentucky. No, Taj. You did fine. Gibson got his chance Monday and made the first game-winning shot of his basketball life, a driving left handed layup on a sharp inbounds pass from Mike Dunleavy as the clock expired to end overtime. 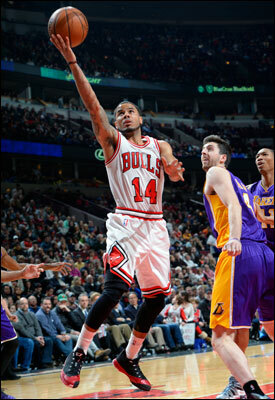 It gave the Bulls a 102-100 victory over the Los Angeles Lakers in the Martin Luther King, Jr. Day special. And it was pretty special all around with Gibson’s game-winner, coach Tom Thibodeau choosing Gibson for the play even though Gibson was shooting two of 10 at the time, Joakim Noah with another brilliant effort with 17 points, a season best 21 rebounds and a team-high six assists, D.J. Augustin with a season-high 27 points including 16 in the fourth quarter and overtime and the Bulls quietly becoming one of the hottest teams in the league with their eighth win in 10 games in 2014. The victory in which there were 23 lead changes and 14 ties also gets the Bulls back to .500 at 20-20 after they’d fallen to 9-16 with the season ending injury to Derrick Rose and the eventual trade of Luol Deng, the Bulls losing their top two scorers. But they’ve worked their way into a three way tie for fourth in the Eastern Conference with Toronto and Washington, a game behind third place Atlanta. Not much is still expected of them. But don’t tell them that. It hasn’t exactly been a Murderer’s Row of opposing NBA talent of late. But the Lakers were coming off wins in Boston and Toronto and had Nick Young throw in a season high 31 points with Pau Gasol looking strong with 20 points, 19 rebounds and five blocks. But despite five fouls and the Lakers going to Gasol basically every time in the overtime, Noah stood his ground and held off Gasol on four straight possessions to enable Augustin to score five straight points to give the Bulls a 100-98 lead with 1:30 left. Then came the dramatic game winner when the Bulls had the ball to inbound with the score tied at 100 and nine tenths of a second left in the first overtime. “Tagy made a great play at the end,” said Noah, drinking it in afterward. “Left hand. He never uses his left hand. A game winner against the Lakers. That’s big time. Taj has hit a lot of big shots. But for him to have a gammer against the Lakers is something he’ll be able to show his grandkids one day. That’s special. And it really was the most unlikely of victories after the Bulls fell behind 66-60 midway through the third quarter and then went Australian Open in the fourth quarter with seven lead changes and six ties and no team leading by more than three point, Augustin making three of his five threes, all of which came with the Bulls trailing and either pushing the Bulls ahead by two or into a tie. The Bulls seemed to have the game in regulation when Noah bounced a pass to Jimmy Butler for a reverse layup and 92-90 lead with 32.2 seconds left. Butler had 13 points, 11 rebounds, five assists and four steals in his typical 49 minutes. Young then missed a 21-footer. Noah rebounded and was fouled with 7.4 seconds left. But Noah made just one of two for a 93-90 lead. It’s the toughest time in games as it comes to the debate of whether to foul or play it out. Most coaches play it out fearing a four-point play with the shot and foul as officials allow a lot of continuation. Noah admitted he blew it as the Lakers inbounded. He got a switch onto Young when Gasol screened Butler and was supposed to foul if Young wasn’t in shooting position. It was probably a situation hard to avoid. NBA officials had been reprimanded in the last month twice for not making calls on game ending three-point attempts. The word was out anything close was going to be a foul. Thibodeau, who always covers publicly for his players, just said it was a difficult situation. Young made all three free throws to tie the game at 93 with 4.1 seconds left. Dunleavy then inbounded to Noah, who usually has shooting room for obvious reasons. Noah took the ball, dribbling down the left side and missed with a running hook to send the game into overtime. It was a dejected Bulls group that quickly fell behind 98-93 two minutes into the overtime before Augustin gave them hope. And Gibson gave them life. It was a heck of a play call, though the Bulls with the score tied at 100 after a Young pull up jumper with six seconds left first drew up a corner jumper play for Dunleavy. Augustin got the ball circling around right and down the baseline. His pass to Dunleavy was deflected out of bounds with nine tenths of a second left and looking like another multiple overtime. Thibodeau didn’t hesitate and drew the one option play for Gibson. The Bulls have run it before, but always for a guard or wing player. Not for big men. So Gibson was a bit taken aback, clearly. You could see him in the huddle trying to act indifferent and Butler talking to him. Dunleavy set up out of bounds on the baseline to the left of the basket. The players were in a stack with Gibson behind Butler. First, Augustin took off toward the ball pulling his man with him. The key part next was a sort of football block from Butler right in front of Gibson. Butler like a lead pulling guard drove his man, Young, toward the baseline and out of the play. Gibson then followed Butler. Gibson’s defender, Manny Harris, got squeezed behind Gibson as Gibson was so tight with Butler he could not set up in front of Gibson. Harris tried to get around Gibson to get in front as the ball went in. It was too late. Gibson held him off, got the ball and went up quickly left handed off the backboard. The officials went to replay, but it just gave everyone a chance to celebrate on the court as the ball clearly was in before the light came on. The officials quickly signaled a thrilling Bulls win. It wasn’t all thrilling as Kirk Hinrich went out with a possible hamstring injury. If he cannot play as the Bulls move on to play Luol Deng and the Cavaliers Wednesday, Augustin is the lone point guard available after the deal to trade Marquis Teague is to become official Tuesday. Thibodeau said they could go big playing through Noah or use players are different positions. But Augustin says he’s ready for anything. And the Bulls are feeling it.